Live at Total Meeting may be the first album I’ve heard where a flute plays the bass line. About halfway through the first of three long performances from the 2010 Total Meeting Festival, there it is, Jerome Bourdellon’s bass flute, trudging along, the instrument with the airiest reputation anchoring a unique instrumental line-up. I like to think of Live at Total Meeting as continuing in a great Threadgillian tradition: delighting in the concoction of new timbral stews, relishing the results of unusual juxtapositions of instruments. The ingredients here include not only Bourdellon’s flute, but also violin, trumpet, bass clarinet, and a variety of percussion. I’m willing to venture that Carlos Zingaro is the best improvising violinist around right now. He’s quick-thinking, quick-fingered, and constantly surrounds himself with high-caliber musicians. Though the performances on Live at Total Meeting tend toward the long-winded, they’re constantly being rescued from monotony by Zingaro’s ability to thread his lines through the other instruments and pull them all tight again. “Total 4” bursts into a breathless, high-register swarm that brings to mind truly Angry Birds (or at least, extremely restless birds) before taking a darker, brooding turn with plodding toms and creeping clarinet. “Total 3” culminates in a prickly counterpoint that might also be appropriately described as “Threadgillian,” touching upon some of the strange harmonic effects that Zooid produces when it’s kicked into high gear. NoBusiness’s super-limited LP releases might get most of the ooos and ahhs, but regardless of format, they know a good performance when they hear one. 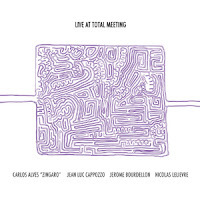 Live at Total Meeting is a CD worth checking out, especially for those who enjoy less traditional line-ups.